This economic pragmatism, in China as well as in Europe, requires the masses to be obedient and follow a petit-bourgeois type of mentality according to which there is only one ‘correct’ way of thinking. In this context, human solidarity, resistance to mass consumerism, friendship, and partnership sound like absolute anarchy. The strength of the market economy fights against the moral economy. Absolute power does not want citizens to be independent; on the contrary, it wants to convince people that each individual is just an insignificant part of the larger group. The result is this lethargy that is equally prevalent in the East as in the West. I became very intrigued, and decided to explore this feeling over the course of several visits, with the help of several people who offered me their trust. In the end, what I saw was the worst of capitalism combined with the worst of communism. In China, I saw Europeans eager to rapidly put aside the basic values of democracy and human rights in the name of economic pragmatism. I realized how technology encourages betrayal and can become a powerful hand of the police state, and comes to embody the police state. This does not affect only China; it is also the future that is presented to us here in the Czech Republic, where the current government hails the Chinese model as a prime example of a ‘harmonious and stable’ society. When communism fell in 1989 in central Europe, our societies adopted the dream of consumerism, without fully integrating Western values. Václav Havel, the writer and dissident who became President, thought it would be better to move on, and to turn the page on communism. But it doesn’t work like that. When people who had worked in the secret services realized there would be no need to answer to justice, they engaged in business, got rich, and managed to dominate the political scene. The result is that today, we have a Prime Minister who is an oligarch and who collaborated directly with the secret services. This shows that, as in China, there is no real rule of law. Most Czech people might complain about life in the comfort of a beer pub, but in the end, they will demand and agree with a ‘strong leader.’ It is this tendency for authoritarian regimes that allows the China model to be admired and partially copied here. For too long, countries of Eastern Europe remained satellites of Moscow, as if they couldn’t exist on their own. Like teenagers they now search for modes of self-confidence, and they find it in nationalism, in refusing the EU while accepting all its money, in refusing to show solidarity. Ultimately, what we lack the most is a culture of engaging in a conversation with solid arguments. People just want to throw ‘their truth’ without listening to the other side. This is also why I put two cat characters in my novel, Mansur and Pomeranč. They are full of wisdom and humor, and see things in perspective. They represent the force of critical thinking. Indeed, in my novel all the main characters go through their own ‘lead hours,’ through a life crisis, which is mirrored by a social crisis. Because, just as humans experience puberty, middle age and old age, societies go through a similar cycle. Overall, it took me five years to write this book, and I now consider it my main work. FN: Under communism, writers had to choose between two radically opposed positions in relation to power: either they embraced the official discourse and led comfortable lives, or they opposed it, like Havel, and had to endure a ban on publication, prison, or exile. Yet a figure like Bohumil Hrabal (1914–1997) managed to occupy a space of ‘tolerated critical thinking.’ Does this describe your role today? RD: Hrabal is indeed an interesting figure. All he wanted was to be authentic, to live according to his own convictions. That certainly irritated many people, who didn’t know what to make of his choices: he refused to become a ‘politically engaged author,’ but instead joined the steelworks for several years. At the opposite end, I see Kundera, who is also present in my novel. In the 1950s, at the height of Stalinism, he was a staunch supporter of the system. When he fled to the West in 1975, he managed to remain part of the elite; he gave the West the narrative it wanted to hear and became a welcomed hero. In 2008, we saw further examples of how he is untouchable, when world-renowned writers rushed to defend him after one historian suggested he might have collaborated with the secret police. Strangely, there was no further investigation to find out what really happened, whatever it was, and once again, critical thinking was stifled. In the end, the mission of art and literature is ‘to not spread lies.’ It is as simple as that. I do not see myself as a ‘politically engaged author,’ as a rebel. No. I just want to speak the truth because I cannot stay silent about the pain affecting others. I am shocked that when I give interviews or do readings, people thank me for ‘voicing things’ that are actually so simple and clear! FN: It seems there is a common thread linking several of your novels: the refusal to face a recent and painful past, and the consequences of this denial. RD: Indeed. We don’t want to look back, and yet going through that pain is the only way to clean those wounds. What is happening with Lead Hours is exactly what happened with Money from Hitler: I receive anonymous phone calls and emails full of hatred and insults. People are annoyed, and are unable to articulate arguments. And yet what I wrote are novels, not history books! But my novels do not fit into the mainstream constructs of historians, or in the majority discourse of Czechs being portrayed as victims of history. People are quick to claim that under Nazism, or communism, “It was just a different time.” The truth is people were guilty, and when we forget the real victims of that period, we end up killing them a second time. Thus things must be named. This is equally important for our future generations: what kind of message are we giving them when we allow a Prime Minister to bypass justice, openly lie and cheat? FN: One of your favorite words is ‘micro-situation.’ What does it refer to, and are those ‘micro-situations’ the inspiration for your scenes, or even for an entire novel? RD: Micro-situation is a word I invented for lack of a better term. It indeed refers to a moment in daily life that reveals everything about people, about society. It contains the embryo that will eventually grow into a full novel because it embodies a truth about human behavior. This method became particularly important in China, since I don’t speak Chinese. What I noticed are situations where something essential hangs in the air. My thoughts immediately accelerate and I rush to write them down. Eventually, those micro-situations become small streams that grow into the main flow of the novel. I write because I want those micro-situations to be in my book. While people like to postpone plans and decisions about their lives, micro-situations show that life happens here and now. I can share an anecdote with you, related to the importance of micro-situations. A few years ago, I was in Germany giving a reading about Money from Hitler. One rather aggressive German asked me about the issue of reparations for the Germans expelled from Czechoslovakia. (Note: in 1945, Czechoslovakia expelled the remaining ethnic Germans who were citizens of the country, in the name of collective guilt for their support of Nazism. Over two million people were banished and deprived of property, and several thousands were killed during the operation.) I understood him emotionally, as he came from a family of ‘expelled Germans,’ but I asked him this: “And who will pay reparations to all the women raped by the armies during the war?” He was taken aback by my question, and reacted quite spontaneously by saying: “But those women were just raped.” That word ‘just’ resonated so deeply with me, that I decided I would have to explore this. Eventually this word became the theme of what was then my next novel, Addendum to the History of Joy. FN: I know you write essays directly in German; you also translate from German, mostly Herta Müller. Does this process of taking a distance via another language, and looking at Czech from the vantage point of German influence, shape your writing in Czech? RD: When I translate, I take a break. I don’t mean to say that to offend translators; translation is certainly hard work, but compared to writing, it is still easier. I started to translate plays when I was working at the Theater on the Balustrade (note: Divadlo na zábradlí was a landmark stage joined by Havel in the 1960s), and now I choose only authors I like because of the way they work with language. But to be honest, I almost regret that I ‘give them my Czech’ as I work hard to find adequate yet creative equivalents of tricky German phrases. FN: In the past five years, you have started to travel extensively, as you align writer’s residencies in Austria and New York, and get invited to the most prestigious literary festivals. Are you perceived differently inside and outside the Czech Republic? RD: There is a huge difference. For years, I did what I wanted to do in the Czech Republic, outside of the mainstream literary scene. That led to a lack of understanding, or even mockery. I was accused of airing dirty laundry in public, yet what people don’t understand is that I criticize this society simply because I indeed care about its future. Thus for a very long time, I thought my readership would remain quite limited. But the foreign translations came, and that changed everything. It brought recognition, not about my persona, but about each of my books. In the end, I am not a Czech author, I am simply an author. And while I would love to live in Berlin, for example, where so many eastern European authors have moved in order to escape the likes of Hungarian Prime Minister Orbán, I also realized that I need the face the challenges here in the Czech Republic. At some point, Havel was offered asylum in Switzerland but he decided to stay. Of course he risked much more. One of my favorite Czech authors is Božena Němcová (1820–1862), a leading figure of the National Revival Movement that promoted the establishment of Czech language and culture in opposition to German. She was a very independent spirit, writing in German herself, and comparable to George Sand in her modern views and attitudes. But she was crushed by her husband, and by the leaders of the cultural movement who imposed Czech and conservative views on her. She died in poverty, almost starving. To me she symbolizes the provincialism of mainstream Czech culture. I will say this: in fact the National Revival Movement never ended, it just started again in 1989 with the end of communism. FN: Tell us about the plot of Lead Hours. RD: The novel tackles the issues of our time, in China as well as in Europe. One of the main characters is Pomeranč, a cat who is a thousand years old, lives in China, and comments on the world of humans. He also remembers the time he spent living with people like Milan Kundera or Martin Luther King. The main human characters are a Czech businessman, his wife and daughter, a Russian diplomat, a French literati, and an American student of calligraphy who have all experienced traumatic experiences in their lives, such as puberty, mid-life crises, or major burnout. They are pilgrims and life travelers who moved to China to find some solace, yet their personal world continues to fall apart. They are unable to recognize the fact that they are losing something essential. They turn back to their past to find solid ground, yet they fail in this attempt. The old world of Europe is crumbling, and no one knows what will come next. At this point in life, everyone undergoes her or his ‘lead hour’—a crucial existential experience that will determine the future. People retreat into their inner selves and fall into lethargy, yet action is still possible and each must find and follow a sign. My novel contains all of the issues of our times; it is a sort of balance sheet of the global age. For the cover of the book, I combined the Chinese characters referring to life and death, because the act of writing is a fight for language. In the book the language seems simple, but in fact it is sophisticated and complex, just as calligraphy is. It is as if I didn’t simply write, but instead used a calligraphy brush to produce those words. The novel offers some hope, no matter how provocative that hope can be. To borrow from Confucius: “If the state or the family is looking for prosperity, there must be some positive signs of it. If the state or family is headed towards destruction, there must be negative signs of it.” My novel is about those ‘signs.’ My duty as a writer is to speak the truth about the times we live in. 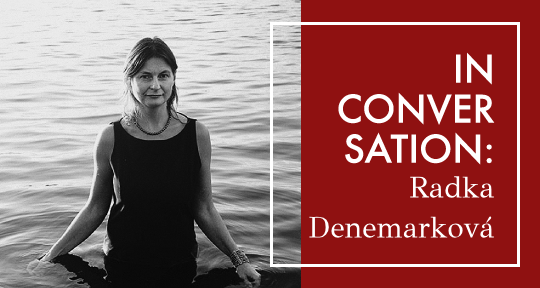 Radka Denemarková, born 1968, is a Czech novelist, dramatist, scenarist, essayist, translator of German literature, and creative writing teacher. She is also the only Czech writer who has received the Magnesia Litera prizes four times (in different categories—for prose, non-fiction and translation). She studied German and Czech at the Faculty of Arts of Charles University, gaining her doctorate in 1997. She worked as a researcher at the Institute for Czech Literature of the Academy of Sciences of the Czech Republic and was dramatic advisor at the Divadlo Na Zábradlí theatre in Prague. She has been freelance since 2004. Her notable works include Peníze od Hitlera / Money from Hitler (winner of the prestigious Magnesia Litera prize for the year’s best work of prose), and Smrt, nebudeš se báti aneb Příběh Petra Lébla / Death, Thou Shall Not Be Afraid: The Story of Petr Lébl (winner of the Magnesia Litera for the year’s best work of nonfiction). For her rendering of Nobel Prize winner Herta Müller’s Atemschaukel (Czech title: Rozhoupaný dech), she won the 2011 Magnesia Litera for translation of the year. Her latest novel Hodiny z olova / Hours of Lead was published in February 2019. Her works have been translated into nineteen languages. She now lives in Prague with daughter Ester and son Jan.
Filip Noubel was born in a Czech-French family, and raised in Tashkent and Athens. He later studied Slavonic and East Asian languages in Tokyo, Paris, Prague, and Beijing. He now pursues a double career as a journalist and literary translator. After ten years in Beijing, he currently works as Managing Editor for Global Voices Online, a citizen journalism platform that publishes in over 40 languages. He has translated and published a number of Czech, Chinese, Tibetan, and Uzbek authors in French, and serves as Editor-at-Large for Central Asia at Asymptote Journal. He currently spends his time between Prague, Tbilisi and Taipei.